Lots of happy faces at the inaugural Lathrop Mayor’s Cup Chess Tournament. On Saturday May 24th 2014, the chess club at River Islands Technology Academy hosted the inaugural Lathrop Mayor’s Cup Chess Tournament. Thirty children were in attendance for a five round USCF rated chess tournament which was the first of its kind ever held in Lathrop, California. The eight hour chess extravaganza also served as a fund raising event for River Islands Technology Academy with all profits from the food sales going directly to the school. Lathrop’s mayor, Sonny Dhaliwal, came and met with all the participating students. 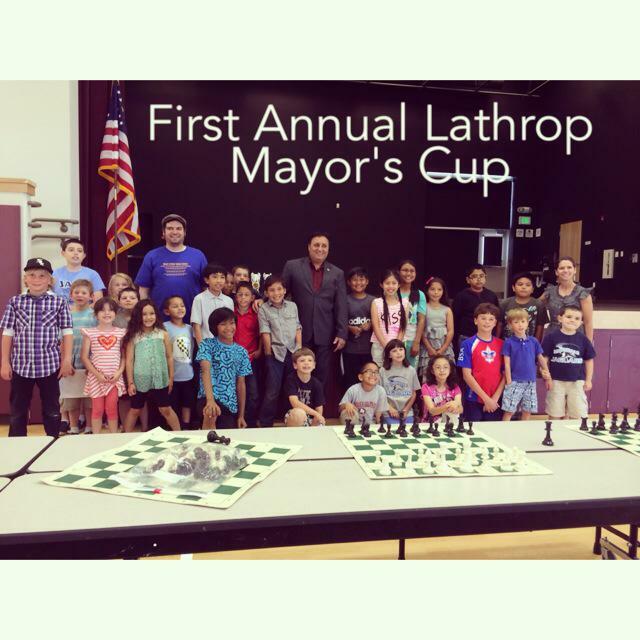 Mayor Dhaliwal was extremely proud to observe so many of Lathrop’s children playing chess. After Mayor Dhaliwal had taken a moment to speak with everyone in attendance, Brenda Scholl, principal of River Islands Technology Academy, gave him a tour of their brand new campus and told him about RitechA’s first school year. At the end of the day Mrs. Scholl returned to present the awards to the participants of all five sections. In the K-1 section Maddox Ramos won the first place trophy winning four of his five games. Rosaleia Torres took second with three wins and a draw. Hayden Hokanson placed third. Mia Viloria tied for fourth place with Rio Torres-O’Callaghan. 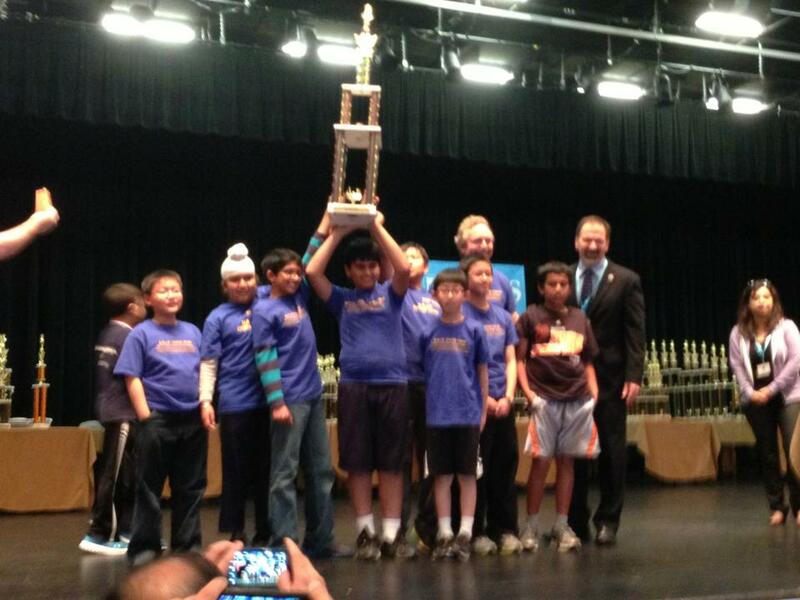 The River Islands Technology Academy Chess Team took first place in the k-1 section. The top players in the 2-3 grade section were Rex Watson in first and Jackson Torres-O’Callaghan in second. The largest section was for grades 4-5. First place went to Omar Silva with a perfect score. Jacob Santos was close behind with only one loss. Travis Torres-O’Callaghan, Chloe Ma, and Armando Silva all scored 3/5 and thus had a three way tie for third place. Again, River Islands Technology Academy placed first as a team. In the final section, grades 6-8, Berkeley Torres-O’Callaghan won first place. Berkely’s sister, Savannah Torres-O’Callaghan tied for second place with Caleb Dunn. Mossdale Elementary School, powered exclusively by the Torres-Ocallaghan family, placed first in this section. After such a successful start, the Torres Chess and Music Academy is already planning four more scholastic chess tournaments to be held in Lathrop during 2014-2015 school year. If your child or school is interested in participating, please contact Chris Torres by visiting www.ChessAndMusic.com. The Torres Chess and Music Academy brings chess instruction to the twenty-first century classroom. Parents in Lathrop, California are growing accustomed to seeing their kindergartener’s eyes glued to the screen of an iPad. Often times their child isn’t watching a movie or playing a kid’s game. 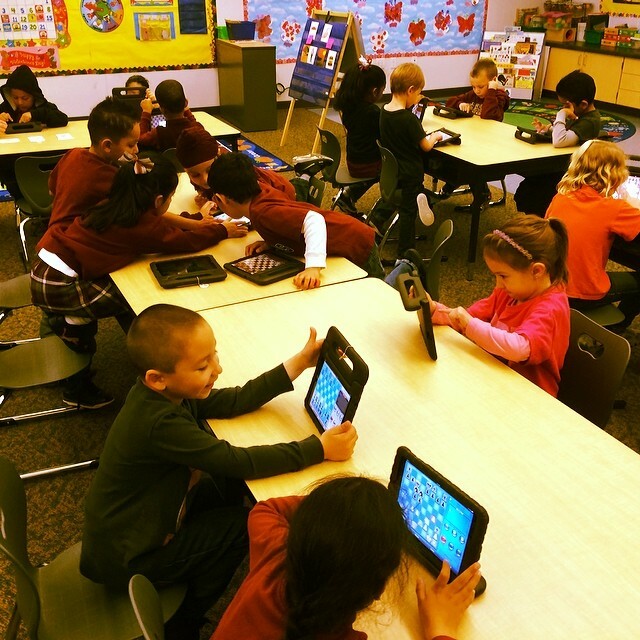 Instead, kindergarteners around town are turning to the iPad to improve their cognitive function or as they like to say, “Play chess.” Since playing chess also improves academic performance, these lucky parents couldn’t be happier. Currently, Chris Torres, the President of the Torres Chess and Music Academy, is teaching nearly sixty kindergarteners at River Islands Technology Academy the game of chess using a combination of the traditional methods he has used to train several National Champions as well as high tech devices that allow his students to grasp concepts at a much faster pace. The results of his new method have astounded the parents of his kindergartener students as well as captured the attention of chess instructors worldwide. Of course, fundamentally changing the way chess is taught to children took years of planning and many partnerships. The first step for Chris Torres was finding a suitable school where children were already exposed to technology in the classroom on a daily basis. An obvious choice was River Islands Technology Academy in Lathrop, California. Founded in the fall of 2013, River Islands Technology Academy is the result of Central Valley visionary Susan Dell’Osso’s desire to create a state of the art technology academy in her home town. Soon after River Islands Technology Academy opened its doors for the first time, Chris Torres approached Principal Brenda Scholl with his plan to bring chess into her classrooms. Brenda became first principal in San Joaquin County to accept Chris’ offer for an after-school chess club. Brenda Scholl also Ok’d a chess period to be a part of every kindergartener’s Friday class schedule. Around the same time, the Torres Chess and Music Academy received a generous donation from Palantir Technologies co-founder Joe Lonsdale that made it possible to bring a first rate chess education to schools in San Joaquin County without any funding from the cash strapped schools or parents. Chris Torres attributes the early success of the chess club to forming a committed team of adults who want to help children in California gain a world class education. This is not Chris’s first attempt at teaching chess. Through the Torres Chess and Music Academy, Chris Torres has brought world class instruction to California’s most talented young chess minds. Some of his accomplishments included running a “Chess Study” with the Kern County Superintendent of the Schools and U.C. Berkeley from 2006-2008. In addition to the study, Chris was able to educate the children in Kern County’s migrant farm worker community in chess and even coach them to prestigious Southern California regional chess titles. 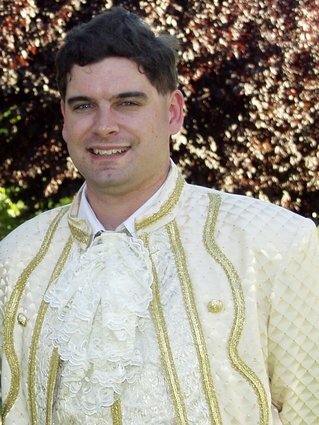 In the Bay Area, Chris was able to instruct several individual National Chess Champions as well as coach for the Mission San Jose Elementary School chess team, which in 2009 and 2013 took first place at the USCF Super Nationals Chess Championship. Chris Torres hopes that the River Islands Technology Academy’s chess club will not only raise the bar for how chess is taught in schools but also serve as a model that other prospective chess educators can follow. To this end, Chris Torres regularly advises parents and teachers on the necessary steps to establishing a successful school chess program. In addition to these free consultations, Chris Torres also uses the Torres Chess and Music Academy as a vehicle to bring chess to thousands of children in Northern California. 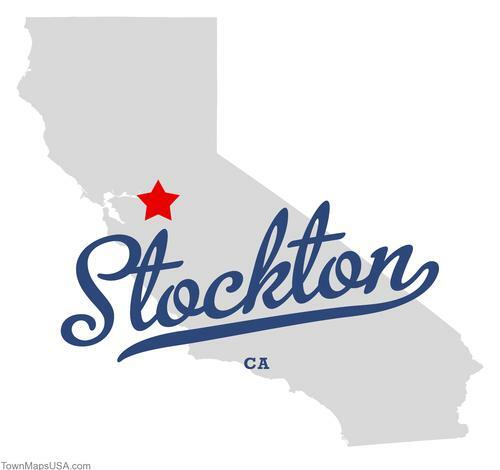 First of all, let me congratulate you on the success of Banta Elementary School District’s charter with the River Island Technology Academy in Lathrop. I have been involved in education for 16 years and have never witnessed the birth of such an ambitious undertaking. Under the leadership of Susan Dell’Osso (Board of Trustee’s President for the River Island Technology Academy ) and Brenda Scholl (Principal of the River Islands Technology Academy) not only has River Islands Technology Academy lived up to all of the hype surrounding its establishment, it, quite frankly, has exceeded all of my high expectations. I am certain that if the Banta School District does not derail its progress, River Islands Technology Academy will be your school district’s greatest educational achievement in its 134 year history. I am addressing this open letter to you because I have noticed some recent events which lead me to believe that the Banta School District is having a change of heart about its involvement with the River Islands Technology Academy. To put it bluntly, both recent newspaper articles and board meeting minutes seem to suggest that the Banta School District has decided to constrict the future growth of the River Islands Technology Academy in order to pursue a Banta controlled science academy at the same school site[i]. Because River Islands Technology Academy is just in its first year, these recent revelations have caused concern that the Banta School District is playing bait and switch politics with the future of several hundred local school children. I am not sure if this was the original undisclosed agenda or if this is a change of direction taken simply on the advice of Tom Duffy. Regardless, I am personally offended that River Island Technology Academy was marketed to hundreds of local families without mention that the Banta Elementary School District planned on taking over the school site as early as 2015. While it is refreshing to see that a school district has promoted one of its own teachers to the position of Superintendent, suggesting that the Banta Elementary School District is making the education of its students its top priority, the recent planned rapid expansion appears to have shifted the intentions of the Banta District from quality education to what is now the “big business of education.” Your current position as Superintendent during the coming period of unprecedented growth will undoubtedly be the star achievement on your resume. However, rather than simply collect accolades for the Banta School District’s growth, as an educator, I would think, that you would like to see the overall quality of Banta’s education improve during your tenure. A quick check of the facts shows that your district is lagging behind the California average in math scores. In fact, in 2013, only 16% of your district’s sixth graders tested at a proficient level in math[ii]. I worry that adding eight new schools to your district before test scores improve may magnify the math proficiency crisis that Banta is facing. Instead of being known as the Superintendent who established an unprecedented growth in the business for your district, you are risking becoming the Superintendent who failed to address the achievement gap of your students. If Banta’s expansion is done too quickly and without regard for educational standards, the Banta School District risks winning the race to the bottom of troubled school districts. Because you are not new to education or politics, you must know that discord between your school board and the board of trustees for River Islands Technology will ultimately hurt all of the children under your influence. Luckily, there are many individuals in the community willing to help you avoid catastrophe on your journey as the new Superintendent of Banta School District. You have a locale that has members who are highly experienced in education and want to see your district succeed. I wish to offer my support to both the River Island Technology Academy’s Board of Trustees as well as the Banta Elementary School District’s board. Study after study has shown that having children play chess regularly increases their proficiency at math. Currently, my chess academy offers chess to hundreds of children and the schools where we regularly teach at score above 97% in proficiency for math[iii]. I will personally see to it that every sixth grader in your district receives special chess training geared toward improving math skills. I have 16 years of experience in this field and will offer this service free of charge to your district for four years. All I ask for in return, is that the Banta School District continue to allow River Islands Technology Academy to remain at its original school site. Basically, if you live up to your publicly stated objective for River Islands Technology Academy[iv] , I will help you increase your students’ math scores and help Banta to become a top district in scores as well as size. [ii] Banta Elementary School’s Test Scores: http://www.greatschools.org/cgi-bin/ca/district-profile/744.